Columbia’s “Digital Dozen: Breakthroughs in Storytelling” celebrates the year’s most creative examples of digitally enabled storytelling as judged by the Columbia Digital Storytelling Lab. The works honored for 2015 include an ad campaign; a video game; an art installation; an experimental opera; an online community whose leaders have been targeted by murderous fundamentalists; and two journalism reports, one employing nonlinear narrative and the other virtual reality. Together they show the extraordinary range of narrative technologies in use today, from simple blogging platforms to virtual reality to face-substitution software. Meet the Columbia Digital Dozen: Breakthroughs in Storytelling for 2015. NEW YORK, NY, Jan. 27, 2016— Columbia University’s Digital Storytelling Lab (DSL) has announced the first annual “Digital Dozen: Breakthroughs in Storytelling,” its list of the most creative approaches to narrative from the past year. The works honored for 2015 include an ad campaign; a video game; an art installation; an experimental opera; an online community whose leaders have been targeted by murderous fundamentalists; and two journalism reports, one employing nonlinear narrative and the other virtual reality. Together they show the extraordinary range of narrative technologies in use today, from simple blogging platforms to virtual reality to face-substitution software. Chosen by members and associates of the Digital Storytelling Lab, a project of Columbia University School of the Arts Film Program, the 12 examples do not conform to any one idea about what the future of storytelling will be. They include highly structured narratives as well as those that let the user determine the outcome. Some take place entirely online; others use digital technology to create or enhance real-world experiences. Some celebrate technology; others use it to warn of a dystopian future. What unites them all is a narrative approach that would not have been possible 25 years ago. The Digital Dozen were selected by Professors Hilary Brougher and Ira Deutchman and Senior Fellows Frank Rose and Paul Woolmington of the School of the Arts; David K. Park, Columbia University’s Dean of Strategic Initiatives; Lance Weiler, Director of the Digital Storytelling Lab and Director of Experiential Learning at Columbia; and Dennis Tenen of the Department of English and Comparative Literature. The initiative, led by Lab member Frank Rose, author of The Art of Immersion, with the support of Lab co-founder Lance Weiler and other members, is intended to encourage innovation, creativity, and an awareness that digital is changing the way we tell stories as much as it’s challenging the business models of companies that tell them. Absolut Silverpoint, an app-based advertising campaign for Absolut Vodka that for two weeks in London combined game, story, immersive theater, and (for some) a free drink. The Deeper They Bury Me: A Call from Herman Wallace, an online documentary in the form of a phone call from a man who spent 40 years in solitary confinement. The Displaced, a virtual reality experience that introduced readers of The New York Times Magazine to three of the 30,000 children who are among the world’s refugees. Door into the Dark, a physically immersive experience that uses digital technology to encourage people to think about what it means to be lost. Freedom, an art installation that employs video and life-sized Teletubby statues in SWAT team gear to provide a caustic commentary on police violence, personal data, and political dysfunction. The Hopscotch Opera, an opera performed in private limousines and in iconic locations in and around downtown Los Angeles, with scenes presented seemingly at random. Karen, an app from a “life coach” who starts off professionally enough but quickly veers into inappropriate territory. Life Is Strange, a video game about a high-school girl who discovers she can rewind time—a useful gift that at a certain point turns unexpectedly problematic. 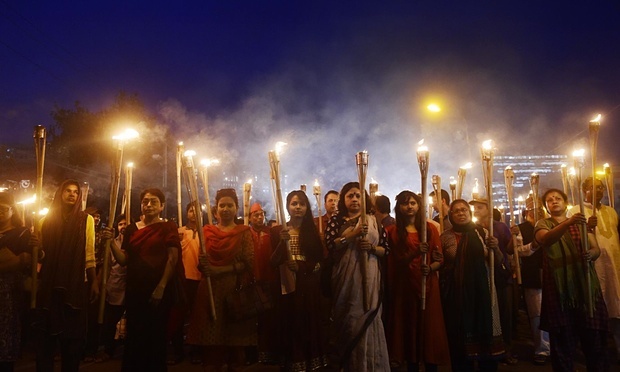 Mukto-Mona, an online community for Bengali free-thinkers and secularists that lost its founder, its founder’s book publisher, and two of its bloggers to machete-wielding Islamic fundamentalists in Bangladesh last year. Network Effect: Human Life on the Internet, an online video experience that portrays Internet existence as frenetic and obsessive and suggests we periodically disconnect. The Pickle Index, a comic novel told in three forms: a paperback book, a lavishly illustrated two-volume hardcover, and a mobile app that thrusts the reader into the world of the story. This Is the Story of One Block in Bed-Stuy, Brooklyn, a New York magazine cover story about urban gentrification that appears online in its true form—as a nonlinear series of linked narratives and data visualizations. A multidisciplinary project spearheaded by Columbia University School of the Arts Film Program, the Columbia Digital Storytelling Lab was set up to design stories for the 21st century. Headed by co-founder Lance Weiler, Columbia’s Director of Experiential Learning and Applied Creativity, the lab builds on practices originating in the arts, humanities, and technology. Its leading contribution to date is “Sherlock Holmes and the Internet of Things,” a global storytelling experiment led by Weiler and award-winning game designer and lab associate Nick Fortugno that uses an ever-evolving detective narrative to examine the policy and ethical issues surrounding the Internet of Things. Columbia University School of the Arts awards the Master of Fine Arts degree in Film, Theatre, Visual Arts and Writing and the Master of Arts degree in Film Studies; it also offers an interdisciplinary program in Sound Arts. The School is a thriving, diverse community of artists from around the world with talent, vision and commitment. The faculty is comprised of acclaimed and internationally renowned artists, film and theatre directors, writers of poetry, fiction and nonfiction, playwrights, producers, critics and scholars. Every year the School of the Arts presents exciting and innovative programs for the public including performances, exhibitions, screenings, symposia, a film festival, and numerous lectures, readings, panel discussions and talks with artists, writers, critics and scholars. This year, the School marks the 50th Anniversary of its founding. For more information, visit arts.columbia.edu.